At Bel Villagio Family Eye Care the health of your eyes is our first priority! You may have an underlying condition that could effect your vision, such as diabetes, high blood pressure or a neurologic disorder. Without a thorough eye exam these conditions could be missed. We are dedicated to providing you with high-quality comprehensive eye care. We will take the time to educate you on your exam procedures and findings, so that you can make informed choices concerning your eye health and overall care. We partner with like-minded surgeons and health care facilities to ensure you get the best possible care. Depending on your age, health and occupation, the American Optometric Association recommends a comprehensive eye examination every 1-2 years. 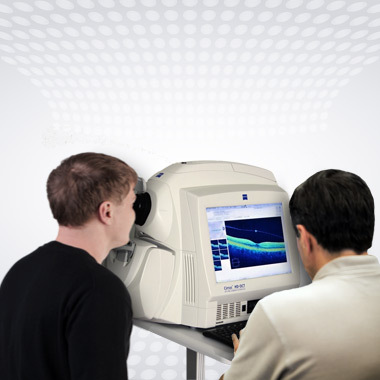 A thorough eye exam includes an evaluation of the visual system and eye health. A comprehensive eye exam can detect systemic conditions such as diabetes, high blood pressure, elevated cholesterol and neurologic disorders. If vision correction is needed, options include glasses, contact lenses and laser vision correction. You can be confident that your doctor will help you make the right choice and offer the appropriate services, such as pre- and post-op LASIK care, necessary medical treatment or vision correction with contact lenses or glasses. Myopia (Near-Sightedness) Control - What Is Myopia Control? Although an outright cure for nearsightedness has not been discovered, we now offer a number of treatments that may be able to slow the progression of myopia. These treatments can induce changes in the structure and focusing of the eye to reduce stress and fatigue associated with the development and progression of nearsightedness. Why should you be interested in myopia control? Loss of best-corrected visual acuity(BVCA) to worse than 20/70 in the better eye or significant visual field loss, such as Tunnel vision (lack of vision in the periphery) and blind spots. Legal blindness, In North America is defined as: 20/200 or less central visual acuity in the better eye with best possible correction, or a visual field of 20º or less. • Hazy, blurry vision can result from Cataracts. • Blurred or partially obscured central vision is typical of Macular Degeneration. • Diabetic Retinopathy causes blind spots, blurriness and visual distortions. • Poor peripheral vision is a hallmark of Glaucoma. • Retinitis Pigmentosa reduces peripheral vision and the ability to see in the dark. • Light sensitivity and loss of contrast are other symptoms of these and other diseases. If you have a vision impairment that interferes with your ability to perform everyday activities and enjoy life, your first step is to see one of our eye care professionals for a complete eye exam. Poor vision that cannot be corrected with eyeglasses or contact lenses could be the first sign of a serious eye disease such as Age-Related Macular Degeneration, Glaucoma or Retinitis Pigmentosa. Or it could mean you are developing a Cataract that needs removal. Whatever the case, it's wise to take action before further vision loss occurs. If we find that you have vision loss that cannot be corrected adequately with standard eye wear, medical treatment or surgery, he will help you take the next steps toward coping with your new situation. We will take the time necessary to thoroughly evaluate the degree and type of vision loss you have, prescribe appropriate low vision aids such as lighted handheld magnifiers, digital desktop magnifiers and bioptic telescopes, and help you learn how to use them. Newer options include handheld digital magnifiers for shopping or eating out, as well as software that simplifies computer use with magnification and text-to-speech features. We can also recommend non-optical adaptive devices, such as large-face printed material, audio recordings, special light fixtures and signature guides for signing checks and documents. Special eye wear with tinted UV filters can help with light sensitivity and heighten contrast. If necessary, we can refer you to a mental health professional and/or mobility coach to help you cope with your vision loss. At Bel Villagio Eye Care, we believe in alternative treatments that have been scientifically validated. As such, we offer interventions that have been supported by evidence based medicine and the peer reviewed literature. Integrative medicine "cherry picks" the very best, scientifically validated therapies from both conventional and CAM systems. Two such examples, are vitamin supplementation for Age Related Macular Degeneration (AREDS2 Multicenter Trial) and Omega-3 supplementation for the treatment of Dry Eye (Effect of Oral Re-esterfied Omega-3 Nutritional Supplementation on Dry-Eye Disease). As with any type of intervention, these disease entities and their related treatments, require close monitoring and follow-up with your eye care professional. They may also require care that involves a multidisciplinary healthcare team. At Bel Villagio Eye Care we take contact lens fitting, lens care and follow-up care seriously. Our doctor is knowledgeable with the latest trends and developments in contact lens technology. We have experience fitting some of the most difficult eyes, including patients with Keratoconus, poor surgical outcomes, and large amounts of astigmatism. We will work with you to find the optimal contact lens fit to suit your visual and lifestyle needs. We can help you determine if laser vision correction is right for you. They will work together with a local surgeon to provide both pre- and post-operative care. Have you ever added up the time you spend in front of your computer, iPad, smart phone or other electronic device? Have you seen the recent reports concerning our electronic devices and our increased exposure to harmful blue light? Bel Villagio Eye Care can recommend the best lenses for you and your lifestyle, including lenses for special computer distances, and specialty lenses and coatings to reduce glare and your exposure to harmful blue light. We are available, should an emergency or urgent situation arise. Simply call our office at (951) 587-2333 and our team will assess your condition. If you cannot reach us, please go to the nearest emergency room or call 911.